I finally finished the Grandmothers Flower Garden quilt I was working on! WooHoo! I know I talked about it before but let me give you the whole story. This quilt top was going to be thrown out by a family going through their mothers things after she passed away. 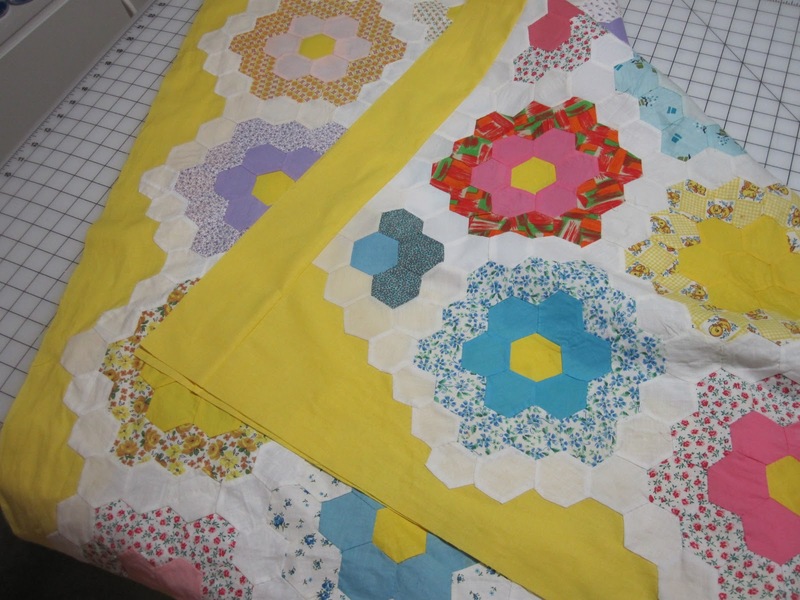 It was rescued by the daughter-in-law because she never got a quilt of her mother-in-law's. So she took it to a local quilter (my wonderful friend, Terri ) to have it finished and quilted. Then Terri hired me to finish the top and put the borders on. Did I lose you yet? You can see I had to put a few blocks in. No big deal, you would think, they were already completed blocks all I had to do was add them to the main quilt top. Unfortunately when the hexagon template was made they did not make it square (if you can say that about a hexagon?). No two sides were the same!! So yes this caused me to work a little harder. I think I un-sewed about 35% of what I did sew trying to get the blocks to lay as flat as I could get. I had a couple people ask how I was going to put the borders on, so I took some pictures along the way. 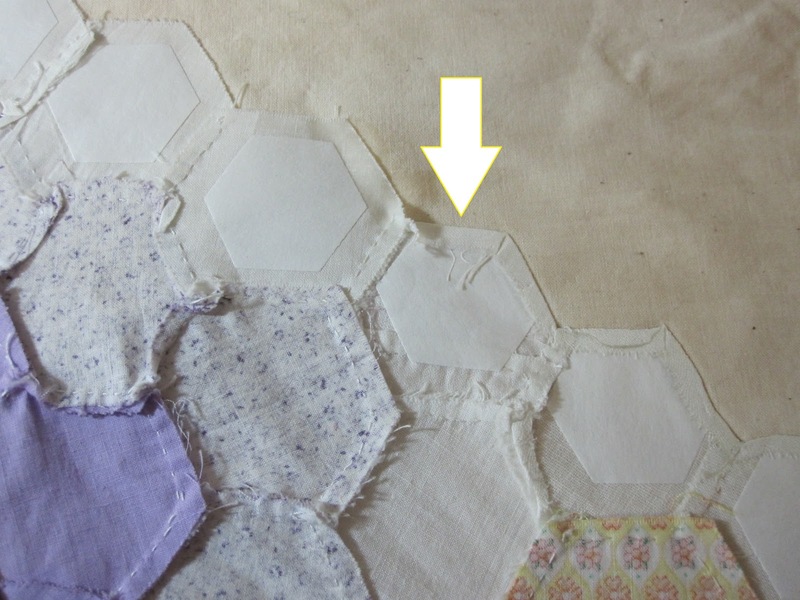 First I cut hexagon shapes (with my Creative Memories punch) out of freezer paper, put a little starch along the edge, folded it over and ironed it in place. This creates a nice turned edge to applique onto the border fabric. This was only done on the two sides that had mountains and valleys from the block shape. The other two sides were straight. After all the edges are turned I position this side over the border fabric, I add a thin line or small drops of Roxanne's Glue along the edge of the folded fabric, being careful not to get any on the edge I will be sewing. 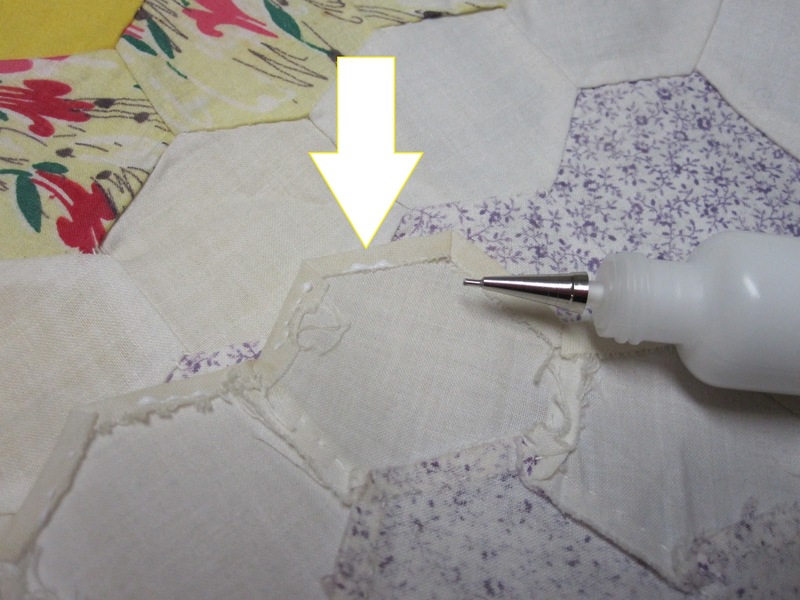 Then just hold the quilt top in place for a few seconds and you have a nice strong bond to your border fabric and can applique the edge down. 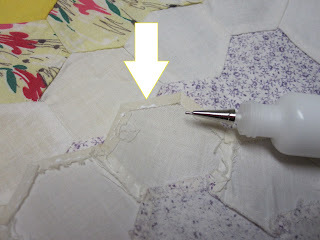 Then after those two sides are appliqued on, straight edges were very easy to just pin in place and sew on my machine. I forgot to take pictures of that part, sorry, I was so excited to be in the final stretch of getting it done! 23 1/2 hours of work later, its all ready to go back to the quilter to be finished!! 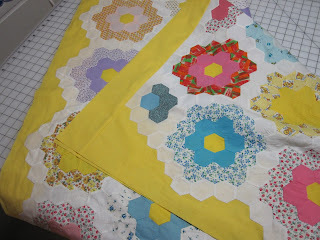 It is such a pretty quilt, and I have spent so much time with it I hate to see it leave!! I can just see this draped over the back of a white wicker love seat on a 3 season porch! (of which I have neither, darn!) It has been a wonderful adventure and fantastic learning experience, I would do it again anytime. Terrific, Bobbi! It looks great! I don't think I am paying you enough! !